Map of the streets and areas that will be closed around Bobby Dodd. Beginning Feb. 14, major construction will be held around Bobby Dodd Stadium, affecting student activity on East Campus. Frank Lamia, Associate Director of Construction Services, wants students to be aware of the activity around Bobby Dodd. “All of this will happen at the time in phases, and we will open things as we can… This project will go from east to west, and much of Bobby Dodd will be closed,” Lamia said. 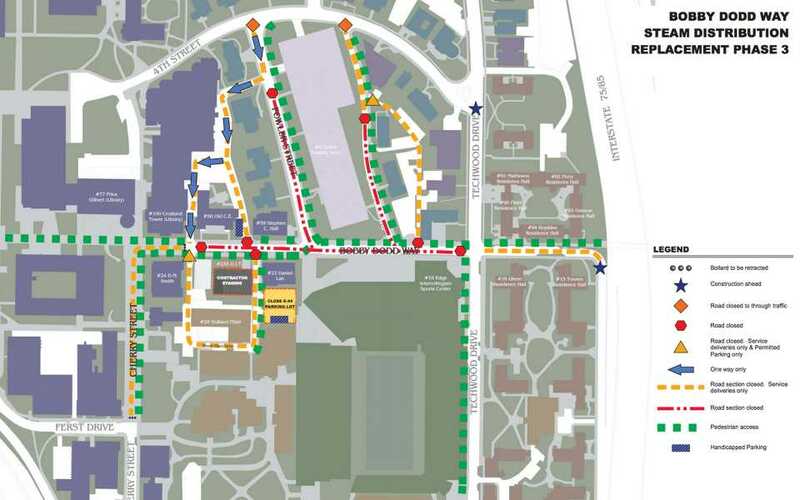 As the construction progresses, Bobby Dodd Way, which includes Freshman Hill, will be closed, and other branching roads, such as Fowler Street and Brittain Drive NW, will be closed until the end of construction. On these roads, one indicated side walk will be opened to pedestrians during the road work. Cherry Street and Power Plant Drive will be restricted to delivery services only, and they will also designate the sidewalk to use. While these road and sidewalk designation may not create any delays, students should be aware of any potential changes in their daily travel routines. “This is going to have an impact of walking. We ask that people follow the signs because Bobby Dodd will be torn up during this and stay in designated areas for pedestrian walking to keep everyone safe,” Lamia said. The construction that will be held includes three separate projects that are intended to improve conditions around the streets and sidewalks of Bobby Dodd, which include replacement of the existing steam line, improving drainage around Bobby Dodd and the completion of streetscaping. For the steam line replacement, this is one of the main changes to be made because the current system s over fifty years old – far past its usable lifespan. Another project is the improvement of drainage around Bobby Dodd. New drainage could lead to better dispersal of water during rain, and fortunately, Techwood Drive and Bobby Dodd Way may not be so much of a river as it has been in the past few weeks. The last addition to the construction project is the further streetscaping from the library down to Techwood which will involve sidewalks, landscaping, street lighting redoing the road and its marks along Bobby Dodd Way. “It is going to reroute vehicular and pedestrian traffic. Right around the area, it will affect student life, but there will always be pedestrian access through one open sidewalk or crossing Bobby Dodd to get where you have to go. But, it will not be as convenient,” Lamia said.